Thanks for stopping by to read more about Usborne Books and my ONLINE Kick-Off Party! To celebrate being a NEW Independent Consultant for Usborne Books & More, I’m having an ONLINE party! How exciting to shop ’til you drop in your pajamas and without make up! If you’ve missed my previous posts in this series, view these to find why I started selling Usborne books, Book Recommendations for Boys, Book Recommendations for Girls, and Books for “Learning to Read” and Beginning Readers. There’s a Mouse About The House!–This is an interactive book with an accompanying “mouse.” The mouse goes through various slots in the book and in doing so goes about the house. Your kiddos will love putting the mouse through the hole and following his journey about the house! Find the Duck–This is a classic of Usborne book lore. Many of their books have a hidden duck on each page. This board book allows your little one to search for the infamous Usborne duck. So fun! Lullabies–This board book has an accompanying CD. Read the night time poems and lullabies and listen to the songs as well! Or, if you’re new to parenthood and want to learn some lullabies to sing to your kiddos, this is a great one! I have written about Farmyard Tales (YAY for an audio book!) You should also check out the Secrets of the Apple Tree. It is a “flashlight” book, which is amazingly unique! On each page, a question is asked of the child reading the book. To find the answer revealed, the child shines a flashlight on the back of the opposite page! I’ve never seen another book like this! LOVE IT! Or, if you prefer the beach, Secrets of the Seashore, is for you! This is another “shine-a-light” book involving seashore-themed exploration. First Thousand Words–These little gems are available in a myriad of languages–English, French, Spanish, French, Chinese, Japanese, Italian, Latin and Russian. These are fabulous picture books to use with toddler to teach him/her new vocabulary! So, grab your little one, let him/her plop down in your lap and enjoy some quality bonding time learning new things! The other amazing trait of these books is that each non-English version is internet-linked, so you can go online and hear a native speaker pronounce each word! (Latin is not included since it is no longer a spoken language.) That’s a fabulous “freebie” of these books! Isn’t that amazing?!!? Now you know why I love Usborne, don’t you?!?!? You Choose–This is another unique book! Literally, you choose answers to questions as you work your way through the book. This book is designed for parent and child to talk through together. Your eyes will feast on colorful illustrations, and your heart and soul will delight in the dialog that you have with your child as you hear more of his/heart and thoughts. Big Books–Usborne has an entire series of “Big Books.” Big Machines, Bugs, Animals, and Sea Creatures to name a few! Besides the fascinating content, each book has fold out pages to show the actual sizes of the book’s theme: machines, animals, bugs, or tractors! So, so fun! Muddle And Match–I’m, also, currently in love with the Muddle and Match book. Of course, we have the boy version, but there is a girl version, too. The book is sliced into segments, “muddled,” if you will. Your child can then match the various segments and create a really funny boy or girl. You might end up with a knight-pirate-cowboy. The text you read to your child changes with the pictures, so there will be some silly, silly sentences created! Get ready to have a good ol’ belly laugh with your kiddo while you read this unique, one-of-a-kind book. Are you ready to order? Go here to the online show to place your order and have it shipped to your home! The GUEST SPECIAL as you shop! 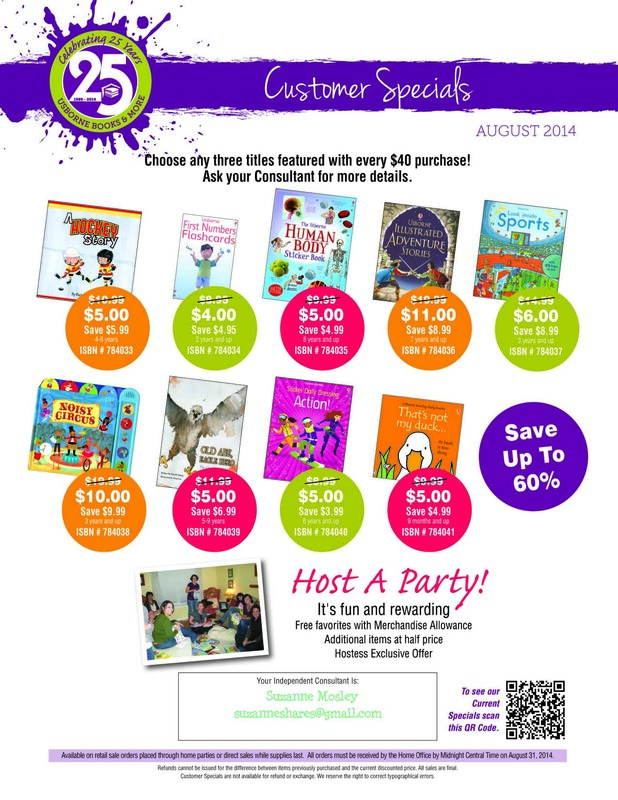 Download the flier here: CustomerSpecials: August 2014 or view it in the picture above. For my CC readers, the Human Body Sticker book is on the list for $5!!! For every $40 you spend, you can chose 3 books from this month’s list. Don’t you love a sale?!?!? Also, since this is an ONLINE party, you can take advantage of the Internet Specials, too. Free Shipping when you spend $75! I will reimburse you via PayPal or will snail mail a check to cover your shipping costs with a retail order of $75. You will pay for the shipping with your order, and once it is processed, I will reimburse you.